This post is sponsored by Polder’s Old World Market. All opinions are my own. I admit it; I’ve been crazy about Polder’s Old World Market wood spoons and other things for quite some time. They are truly swoon-worthy. And I was thrilled when they asked me to work with them. I love to cook and baking is a big passion of mine. I don’t talk about it on the blog much, but I love to bake! 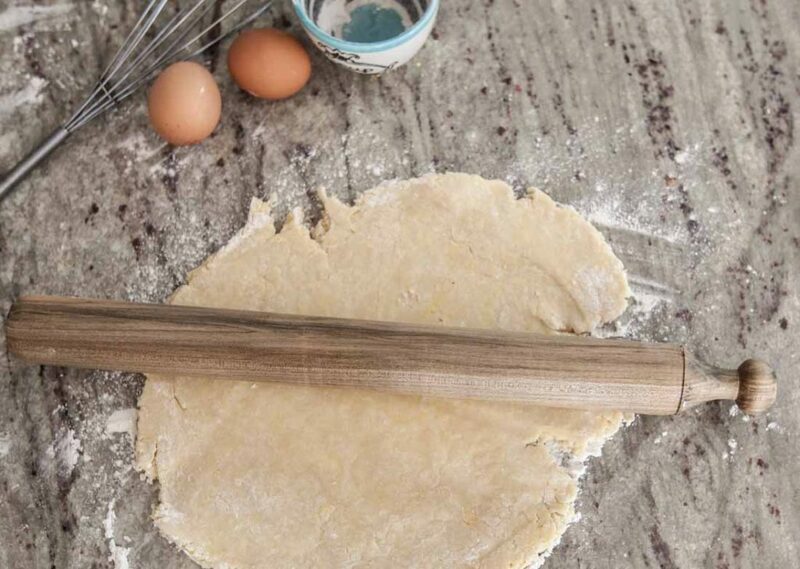 I always say if you need a rolling pin to make it, then count me in. I love making pies and biscuits and working with puff pastry. I love using wood utensils for many reasons, and these are each a work of art. They are all handmade by a member of the Polder family. I’ve bought wood spoons and spatulas before, but they were mass-produced and didn’t have much personality. These spoons do! Be sure to listen to the podcast today. We’re talking about transitioning from your room from one decorating style to another one. They have spurtles, spatulas, scoops, spoons, honey dippers, and measuring cups (not just spoons). I recently made some pies and biscuits using my new French rolling pin. Using these artisan pieces makes it all the more special for me. And here’s the best part. The Polders are so generous, they are offering you a giveaway. 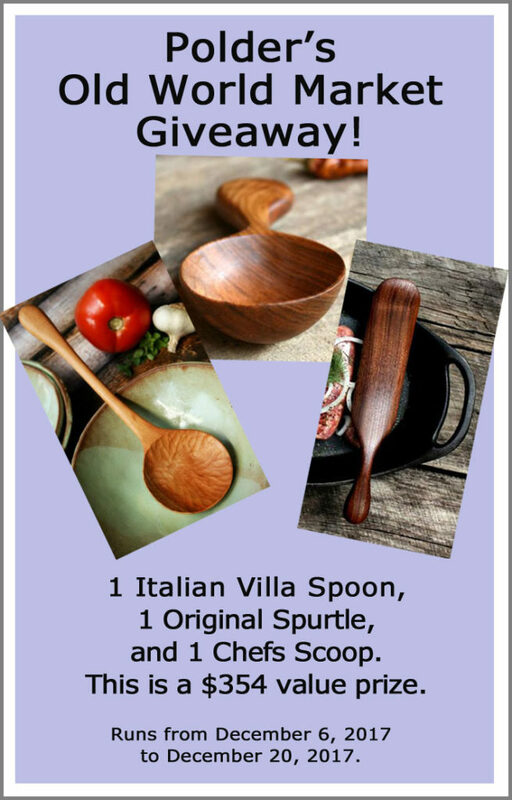 One lucky reader will win 1 Italian Villa Spoon in Fancy Maple, 1 Original Spurtle in Beech, and 1 Chefs Scoop in Cherry. This is a $354 value prize. The giveaway begins on December 6, 2017, and ends midnight December 20, 2017. The winner will receive their price in 3-4 weeks after the giveaway ends. You can have up to 3 entries for this giveaway. Go to POLDER OLD WORLD MARKET and pick out your favorite dreamware piece,. Come back here and leave a comment telling us which one is your favorite. Follow POLDER OLD WORLD MARKET on Instagram, then come back here and leave a comment saying you did. Sign up for the POLDER OLD WORLD MARKET newsletter (email updates) then come back here and leave a comment saying you did. Restrictions: Must be 18 years or older, must be a resident of the US 48 contiguous states. Winner will be selected at random. Winner will be announced on the Cedar Hill Farmhouse blog after the giveaway ends. Winner will be notified by email and has 48 hours to respond. If there is no response, another winner will be selected. No substitutions. I signed up for Polders Old World Market. I am THRILLED to know about this company! I love the Spurtle! The craftsmanship is AMAZING! I am IN LOVE with the “elegant pizza reel”–the wood and shape is magnificent! It is hard to choose with so many fantastic pieces! 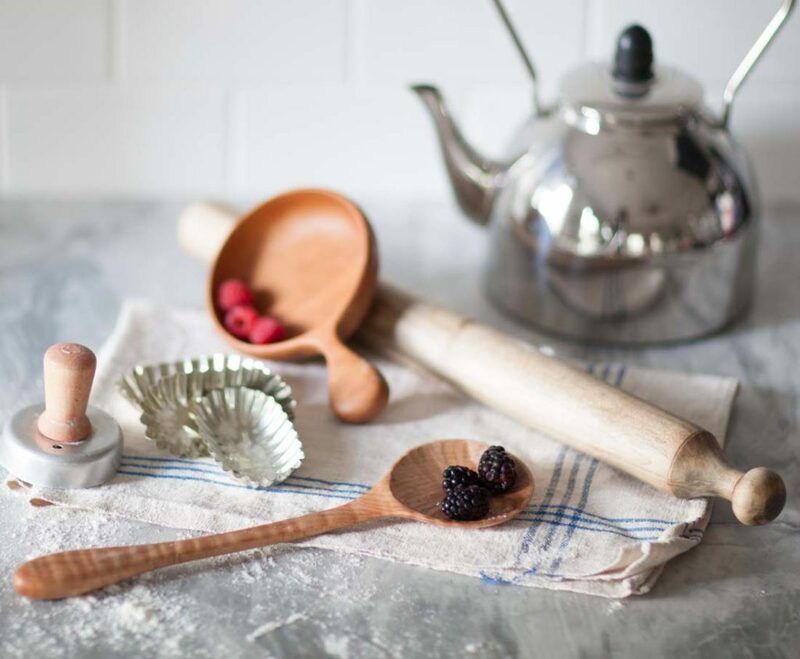 The Vintage Reproduction French Rolling Pin in Fancy Maple is on my wish list! I am following Polders Old World Market on Instagram. yippee! My favorite Dreamware piece from Polder is the Birds Eye Maple Scoop from the Ready Made Collection. It’s perfect for serving mashed potatoes from my vintage crockery French bowl. I am coveting this scoop. Signed up for the email updates which I am hoping is the newsletter! Thank you! Thank you for introducing Polder Old World Market to us. The handcrafted wooden pieces are not only functional they are works of art. I can’t choose one I love…I love them all. The 2 sided measuring spoon and the chef scoop are my favorites. They will go on my wish list and another piece will find its way to my kitchen shortly! As an folk artist, I seek out other artists to fill my home with their handmade treasures. Although I mentioned a favorite already, I have to add that all the scoops are swoon worthy for the cook. I also LOVE THE ITALIAN SPOON and the best seller spoon. My christmas list just expanded. LOL. MY Italian Nonna is getting one of these for Christmas. Thank you for making my shopping for her easier and I know she will LOVE it. 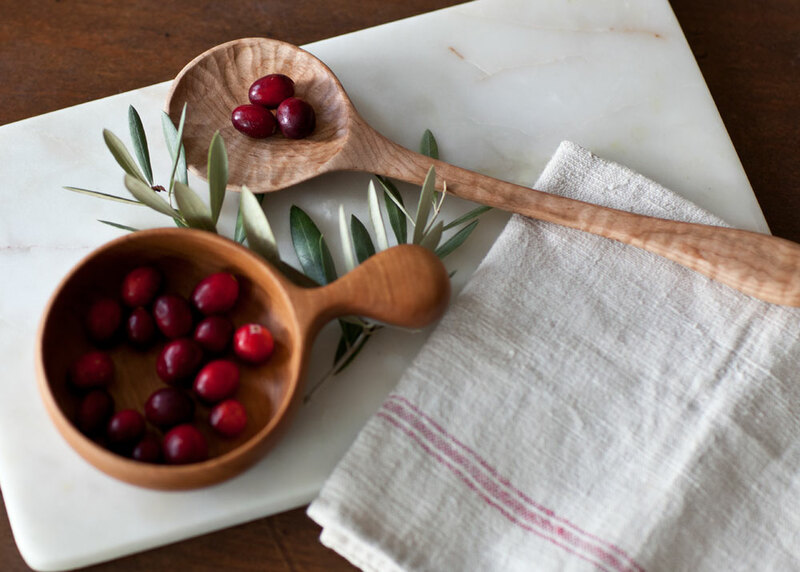 These wooden utensils are beautiful. It is so hard to pick a favorite. The scoops are fabulous, love the shopkeepers scoop, perfect for my flour canister! Also the large pizza peel, fabulous!!! I follow Polder Old World Market newsletter. My favorite is the measuring cups! Outstanding handmade products! A left-handed classic spurted. My old arthritic hand and wrist would celebrate! I have been signed up for the newsletter for about a year. I have several of their pieces and would love to have more! I love their new coffee canister scoop. Actually, I love all their wood utensils, as well as their linens. What a lovely collection. My favorite is the Ultimate Dreamware Collection! True heirlooms! Thank you for introducing me to the Polder’s Old World Market. I’ve added myself to their newsletter and email updates. as a starting point their exquisite spoons. I love the paddle spurtle. I love the Basic Kitchenware Set of 3. Thanks for the give a way, Anita. Love your blog! The cookie spatula would be a really fun piece to have. The Polders work is superb, I d be tickled with any of their pieces! I have signed up for the Polders news letter.. I love Old World Market! I follow them on Instagram. It’s so nice to see form and function in kitchen utensils. I am following Polders Old World Market on Instagram. I’m hoping you received some of their lovely items. I knew you would love them. I thought it would be a perfect Christmas gift for you and checked out their website – but, then, you know my budget – and their prices. 🙁 Guess I need to start playing the lottery! Love you Anita! You don’t need to get me anything Peggy. I love you dear friend!!!! No way! You (and Ella) will always be on my list! I signed up at Polders. It’s hard to pick only one favorite, but I do love the spurtel and the chopping board I use for a charcuterie tray. Love the family’s story and nice to find something made in the USA. I gladly follow Polder Old World Market on Instagram. I have signed up for Polder Old World Market newsletter and looking forward to hearing all the news. Such pretty things! I like the Vintage Copper English Pitcher! Signed up for the email updates! I loved the chef’s scoop! I signed up for their newsletter, such gorgeous things! Love Poulders!! Beautiful things offered! I love the long fancy spoon, though my favorite is the pizza board. I’ve collected hand made utensils for years. Some from craft fairs. Some from Costa Rica! Met a young man there working for my son at his bed a breakfast who was crafting them. They are my favorites! They’re all so beautiful – I love the set of measuring spoons! I love the “New” small cutting board such beautiful quality. Thank you for introducing the Polder family and their beautiful products to me. I love this site. Thank you for the introduction! I’m dreaming of RTS CLASSIC SERVING SPOON, FANCY MAPLE. I would welcome any into our family’s kitchen as their forever home. LOVE, LOVE the measuring cups!!! I signed up for the Polder newsletter. Followed POLDERS OLD WORLD KITCHEN on Instagram. What a yummy collection! Subscribed to POLDER OLD WORLD MARKET newsletter. Signed up for Newsletter. Love all of their stuff!!! So many beautiful choices. The cookie spatula caught my eye. Would love to have any of their gorgeous pieces. Signed up for their newsletter. Excited to hear from this awesome company. My favorite is the ELISHA’S SPATULA….in the fancy maple. It is elegant and useful! I look forward to receiving the newsletter! So easy to enroll! I now follow them on Instagram. The photos are stunning! OH wow! Anita, you really expect me to choose only one favorite??!! They are lovely, works of art. I saw so many beautiful pieces but you said from the dream collection so I will choose the classic wood spatula. Thanks for sharing.. I bought a spoon from them last year and it has quickly become my favorite. Choosing one would be extremely hard. I love the scoops right now. Anita, I couldn’t choose just one.. I really like the large wooden soup ladle!! I am heating up some good ol homemade Kentucky burgoo for lunch today and could use that ladle!! I signed up for their newsletter… Thanks again! Following Polder OWM on Instagram. Love their quality. I signed up for the POLDER OLD WORLD MARKET newsletter. Thank You for introducing us. My favorite dreamware piece is RTS Minimalist Spoon! Just beautiful! I also follow on Instagram and I’m subscribed! ?? Anita… Wow again, their Instagram page is beautiful as well and I found another piece I LOVE..the bread cheese and charcuterie board!! OMG…I WISH FOR IT ALL!!! I signed up to follow them on Instagram!! I will look for them on Pinterest too!!! These tools are incredibly beautiful. My favorite is the Chiseled Bowl Serving Spoon because of the beautiful patterns in the bowl from the carving. I have a love for old wooden spoons, and these are just Fab! I would have to say the petit artisan collection is my fav because you could display all of them in a small space…they are gorgeous! ticked off all the requirements for entry… would be an excellent Christmas surprise! I really love the Chiseled Bowl Serving Spoon because the bowl looks rough hewn! I followed Polders Old World Market on Instagram. I signed up for email updates from Polders Old World Market! My favorite Dreamware is the Classic Serving Spoon. I signed up for the Polder Old World Market newsletter! I love the Copper 5 qt. Tea kettle! Be still my heart! I too collect wooden spoons. How fun it would be to own such lovely pieces! My favorite Polder piece is the wooden honey dipper. Lovely. I just followed them on Instagram. I think they are also on Facebook. Love the coffee scoop. Actually all the scoops. They are so great. I also signed up for their newsletter. Thanks for having a giveaway. I signed subscribed to the Polder Old World Market newsletter. The practical me loved the left handed spittle but the extravagant me wants the pizza peel. Gorgeous wood. Following on Instagram and signed up for there newsletter. I love the thick cutting board. Wow how to choose just one!! They are absolutely beautiful. I think my favorite is the original ladle spoon. I love the little swoop on the tip of the handle. It would certainly be a conversation piece when used to serve soups, etc. I love the classic salad set in the fancy maple! Thank you so much for introducing me to Polder’s Old World Market. I am following Polder’s Old World on Instagram. I signed up for Polders newsletter and followed them on Instagram. Love the handcrafted spurtles!!! They are beautiful. I love cooking with wood. I would love the spatula? Large minimalist spoon. …. just lovely! I’m signed up on their email list. Everything is so beautiful and looks so well crafted. So hard to choose! I’ll pick the chiseled serving spoon. What a beautiful collection of wood housewares. I especially loved the set of measuring cups because they would really add to the enjoyment of baking something special for my family. I visited (and followed) on Instagram and signed up for the newsletter. Thank you for the opportunity to acquire and learn about these beautiful products. I’m now following on instagram as well. Whoever wins is going to be one happy recipient. Thank you for the opportunity to participate. I love the World’s Best Cookie Spatula! And everything else too. I have followed you on Instagram. I love Polder’s Old World Market for their beautiful and stunning wooden utensils. They are all so gorgeous! I especially love the wooden soup ladle. I subscribe to Polder’s emails. Whoa! What beautiful utensils! It would be a celebratory just to use them! My favorite is the Wooden Scoop. I just signed up for the newsletter using another email address. My old computer just crashed, causing some problems with my email which I have always downloaded. 🙁 But the email addresses I use for your website as well as the one I used to sign up will both get to me. I mostly want to use one email address as much as possible until I get things settled. Thank you for hosting this giveaway and for introducing us to Polder’s Old World Market. I signed up for their email newsletter that but the way is beautifully done. I love this small business. I’m looking forward to having a few pieces in my home and have my fingers crossed for your most generous giveaway. Signed up for Polders Old World Market newsletter. I would love to have the 2 piece wooden spoon set! I follow Polder’s Old World on Instagram. I have signed up to receive Polder’s Old World newsletter via email. Love the chef’s scoop in cherry! Follow Polders Old World Market on Instagram. I LOVE THE POLDER’S OLD WORLD SALAD SERVER. OK I am now looking forward to receiving emailds from Polder’s old world. The wooden scoop is absolutely gorgeous and functional! That’s my favorite. Signed up for their newsletter with email – alina dot conn at yahoo dot com. My favorite piece would have to be the RTS Cooking & Baking Spatula, Cherry. The wooden soup ladle is my favorite piece in their collection. Signed up to receive their newsletter. Tall copper country french pitcher is my favorite of my overall favorite section of vintage looking copper collection . Gorgeous pieces! The chef’s scoop. It is so beautiful. I absolutely love the ‘chef’s scoup’ and the measuring spoons! I signed up for their email! A fantastic site! I signed up for their newsletter. I love the new pasta spoon!!! I’m Siciliano & I love pasta ?!!!!!! I’m also in love with all their copper, exquisite….will be asking hubby for a piece for Christmas ? ?? I love the Pure Linen Boho Tea Towels. They are Gorgeous! I love handmade items and their dreamware collection is so beautiful! I think the measuring cups are lovely as well as the spatulas. Thanks for hosting this giveaway! ii am signed up for their newsletter. The mini serving spoon set. I am following on Instagram and have signed up for the newsletter because I am very interested in the art form of these items. The Italian Villa Spoon is beautiful. Thank you for introducing this company to us. I adore ALL of their products. But I think my favorite is the Extra Long Stock Pot Companion Spoon, plus the ORGANIC COTTON PAPERLESS TOWELS. Everything is so beautiful! Thank you for introducing this website! You have my heart with both copper and wood! I love the Italian Villa wooden spoon. I signed up for Polders world Market! Thanks! The Classic Sauce & Gravy Ladle is just gorgeous! Oh, I love Old World Kitchen!! My favorite of their Dreamware collection is the new wooden dough spoon! Signed up for their newsletter the other week!! I love the Chef’s Board!! oh, and of course I signed up for the Polder’s newsletter and followed them on IG. ? The long handled scoop looked so beautiful the wood grain is amazing and what a useful tool. Their craftsman ship is stunning. The Wooden Cookie Dough Scoop. I am already receiving Polder’s newsletter. Thank you. I would love to have the elegant pizza peel./serving board. We make homemade pizza a lot and it is gorgeous. I am subscribed to the Polder’s World Market newsletter. I love the rolling pin, measuring cups, just about everything they sell. My favorite Dreamware piece is the Elegant Pizza Peel. It is gorgeous! I signed up for Polder’s Old World Market newsletter. The Amelia spoon is lovely! The wooden measuring cups sure are cute. I love wooden items and especially handmade! It was so hard to choose! I love the chefs scoop thought. The shape and handle are just beautiful! I just signed up for Polders email newsletter. The craftmanship is really amazing! 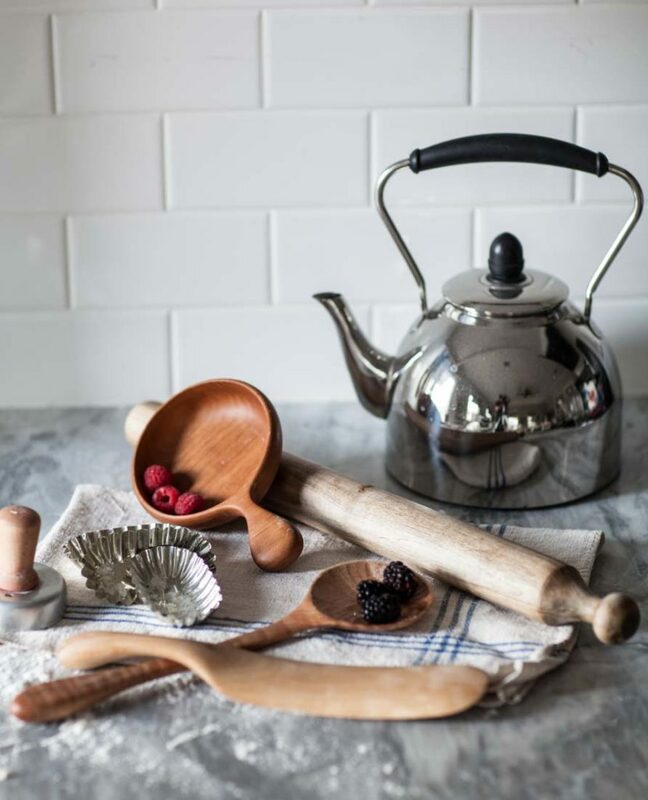 I love the cooking & baking spatula but all their dreamware pieces look amazing. Thank you and Polders Old Wirkd Market fir this giveaway! I would love anything from Polder’s Old World Market…such great things…but like the spurtle. The Italian Villa Spoon is one I would enjoy cooking with ….so beautiful! I follow Polder’s on instagram @rusthawk1. I am a current subscriber to their newsletter. I have subscribed ~ I am just finding these gorgeous pieces! I love them all, but would really enjoy that salad set! Or a serving spoon, or that adorable scoop … I can go on ~ and on! I mentioned that I signed up, but JIC ~ noting this again! What an awesome giveaway … THANKS!!! I would love to win because I love handmade wood items. I also started following you in Instagram. Love the sunrise coffee spoon plus many more items. I also signed up for your newsletter. I signed up for the Polder World newsletter. My favorite piece is the Classic Serving Spoon. It is beautifully crafted and the interior reminds me of a flower in full bloom. I really love the classic serving spoon and the wooden scoop! Their pieces are truly stunning! My kids bought me a walnut coffee scoop from Polders a couple years ago. It’s really beautiful. I am also signed up for Polders newsletter! I absolutely love the Antique Copper Collection, especially the Vintage Copper Tall French Country Pitcher!! Swoon worthy for sure! I signed up for the newsletter. I love to support family businesses. Now signed up on instagram! loved their website!! loved their farm, so beautiful! They have a wonderful life!! I am following Polders on Instagram. So beautiful even to look at! Old World Kitchen has such elegant kitchen ware. I’m in love. I have signed up for their newsletter and to follow them on Instagram too. I’d love the small serving spoons and the rolling pins. I love the Best All Purpose Spoon. It’s gorgeous!!! I’m following Polder’s Old World Market on Instagram. Their copper ware is stunning! I have subscribed to Polder’s Old World Market newsletter. What a marvelous company! Thanks for sharing them with us. Their blog looks so interesting and informative! I love Polder’s Dreamware! I splurged and bought a small scoop last year and it makes me smile every morning when I measure out my coffee beans! I think my new fave piece is the “world’s best cookie spatula”…I bake cookies all the time and am loving this piece right now…..
And yes! I am following Polder’s OWM on Instagram! I signed up for the newsletter! Love this company…. I signed up for the POLDER OLD WORLD MARKET newsletter. I think the Extra Long Stock Pot Companion Spoon and the Classic Spurtle would bring beauty to all my cooking. Dreamware is a very appropriate name for this entire collection for they really are dreamy! So many swoon worthy items! I love the gorgeous Large Wooden Soup Ladle. I totally love that Italian villa spoon in fancy maple. I’ve been looking at it for nearly a year. Guess I need to get it! I follow Polder’s Old World market on Instagram. I also have been signed up for Polder’s old world market newsletter.